The Blackhawks had a couple days off in Florida to consider their overtime loss in Tampa. They could have come out rusty after Thanksgiving against a struggling Panthers team. Chicago came out firing early and often on Roberto Luongo. All four lines were clicking early, and at 9:25 into the first the fourth line got the Hawks on the board. Tommy Wingels picked up the only assist on John Hayden’s third of the season. The top line, which has struggled to produce over the last couple weeks, then got rolling. Five minutes after the Hayden goal, a relentless attack saw Brandon Saad score for only the second time since Oct. 14, extending the Chicago lead to 2-0. 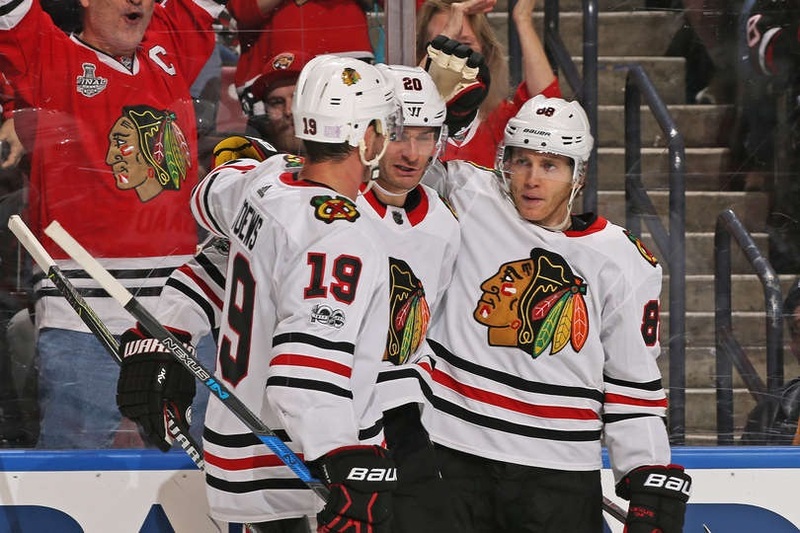 Jonathan Toews and Duncan Keith were credited with assists on the Saad goal. In the opening 20 minutes – without a power play – the Blackhawks out-shot the Panthers 21-7 and controlled the action throughout. But Florida would respond. Nick Schmaltz went to the box with 69 seconds left in the first period, and the Panthers were able to gain some momentum in the closing portion of the penalty that carried over to start the second. Once Schmaltz emerged from the box, a turnover turned into a goal for Florida as Jared McCann cut the lead to 2-1 at 1:06 into the second. Chicago would get right back on the attack, though. 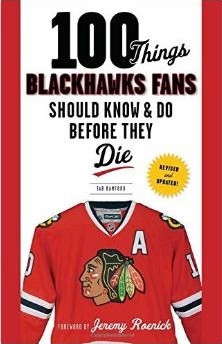 Seven minutes into the second, Patrick Kane sniped home a goal to make the score 3-1. Toews and Saad were credited with the goals on Kane’s goal, giving each a multi-point night. Toews wasn’t done, though. Ten minutes later, he snuck a puck through Luongo to push the score to 4-1. The goal capped the scoring for the night for both teams, and gave Chicago’s captain a three-point night. Toews now has eight points in 10 games in November, matching his point total from October. Corey Crawford carried the load the rest of the way, stopping 18 of 19 shots in the second period and all 12 Florida shots in the third to earn the victory. Crawford made 37 saves in another stellar performance. Toews won 13 of 19 at the dot and had two takeaways to lead the Hawks in those areas as well. Saad was credited with a team-leading eight shots on net, seven of which came in the first period. The Blackhawks return to the United Center to host the Anaheim Ducks on Monday night. Chicago is 4-1-1 in their last six games and have scored 23 goals in those contests. The Blackhawks have successfully killed 27 of 30 penalties in November, and have allowed a power play goal in only two of ten games in the month. Looking like alot better team, good all around game. Big test coming up in next 5 games. Still believe finding a partner for Keith is a needed upgrade. As I said after the last game, the Towes line is creating chances. It is only a matter of time before Panik starts things going. Also, look out for Forsling. This kid seems to be jumping into the play every chance he gets. Certainly a game the Hawks needed to win and they came out with a real sense of purpose. Led by the Toews line one could sense the determination. Only the 3rd line seemed to lack any cohesion although Sharp had a few chances. Maybe we see Vinny up and Hartman down? Better team defense has been evident recently which is what this team had some major problems with to start the season. Forwards getting back to help and d men with better gaps. This had to happen for 2017-2018 Hawks to progress. Special teams are on the up and up, especially the power play which when we really look back could only get better. PK has been solid and has made a difference in keeping games close. Killing recent high sticking 4 minute penalties from Hayden has been a huge lift. Getting offensive pressure and finally production from the Toews line had to happen. Maybe these guys have finally broke out of offensive purgatory. Panik is next in line. He could have had 2 easy last night but couldn’t convert. What is good to see are quality scoring chances not only by Panik, but with the Cpt and Saad. How bout that mid air miracle from Toews last night? Crow as usual held things together. Forsling and Murphy keep getting better and better! They are minding their own end and jumping up into plays. Hawks need points bad and it feels like the guys might be finally starting to string together some quality games with positive results. Bunch of games coming up quick. Now’s the time to push! Phil don’t disagree Hino could be a spark but Hartman most likely doesn’t clear waivers. Looks like it will take an injury that puts somebody on ir to get him recalled. That must be why they are staying with 8 dmen in case of an extended injury and Pokka would have to clear after 10 games again and Gustafson has only 10 games of exempt left or may be not be confident with them either. The ones who are exempt they may not feel they are ready yet, if Snuggerud shows he could be ready for a call up that may change things soon and they might feel more securer with 7D and get Hino up. Thanks Ian for Hartman/Hino clarifications. 3rd line imo looks and needs some spark and energy. Hartman and Sharp need to pick it up quick imo. Drop Sharp down to Rockford and bring up Hino. Sharp is not part of the future and does not offer much more then a slow walk. Forth line is great. A good effort all around. The Toews line has had a few good games in a row, and tonight they got rewarded. This coming week is going to be big. The problem with demoting Sharp to Rockford is waivers. For his remaining hit he probably gets claimed. Which in and of itself isn’t a big deal. The problem comes when you’re trying to sign future free agents. By all accounts he took a discount to come back. Waving him hurts your chances of signing depth guys. I agree hes struggled, but waiving him is managerial suicide. Hartman would get claimed. He’s playing out of position. He’s an agitator. Hartman has more points in fewer games than Shaw, for comparison. He’s not a top 6, but can play there in a pinch. Like Shaw. I’m not saying I’m for it. Because he has value. But, would you trade Hartman and Kempny for a D upgrade? You’re looking for a right shot, top pair type, making 3 million. Good luck. Bogosian if healthy, but retained salary needed. Q said at cuts Hinostroza would probably be the first pending an injury. An injury that hasn’t happened. Perhaps that’s schedule related? The Hawks were the bogey man in Luongo’s nightmares from years past and after the game last night they’re back. Toews swat for a goal following Kane hitting a sliver of opening is sure to be enough for Luongo to keep the light on when crawls into bed. I missed the live broadcast due to family holiday stuff but caught part of the 3rd period on the re-broadcast in the wee hours. Lots of chances both ways. I did see one noteworthy play, although it amounted to nothing – a beauty pass from DeBrincat in the d-zone right up the middle of the ice to hit a streaking Sharp who caught the pass but was unable to get a scoring chance. That is a prime example of DeBrincat’s offensive talents being wasted on a line with “over-the-hill” Sharp and “out-of-position” Hartman. I keep hoping Sharpie will break out of it and at least become a serviceable 3rd liner but we’re a quarter of the way into the season and so far it’s not happening. Maybe it is time to cut bait on Sharp and put Hino between Hartman and DCat with Hartman (RW) and DCat (LW) in their best positions. If Sharp is still bothered by his hip or concussion symptoms or something else maybe a stint on ir us in order, satisfies everyone if thats the case. Been saying it for a while. Move Panik down. Schmaltz to 1rw. Debrincat 2Lw. Panik is the weak link on the top line. Debrincat getting “wasted” and playing where he’s not as effective on the right. Sharp has a no movement clause. No way they insult him and send him to Rockford. Kempny should be traded to one of the teams that originally courted him. Teams are so desperate for competent NHL level defense, he would probably be able to fetch a 3rd rounder. I sometimes like to see how traded prospects are doing…..can’t find much on Marko Dano, is he injured? Confidence is starting to build with this team. The kids are starting to take the pressure off the veterans. The offense is starting to find the net, the defense is playing aggressively and “the most underrated goalie” in the league is playing really well. Let’s see where this all goes over the next month. Sharp has a NTC. But I agree you can’t put him on waivers just cuz he’s unproductive. Managerial suicide. One interesting tidbit I heard from last night…Hawks lead the league in shots off the post/bar. Not sure where to find those numbers to back it up. A reporter ask Q if he was aware of the fact the Blackhawks led the league in hitting posts and crossbars and Q replied he didn’t realize they kept those stats. Ernie can’t find where stat us bit an article in Tribune says 17 pist and one crossbar, with Debrincat 3 posts and Kane 2 posts and Cbar the most followed by Sharp and Saad 2 posts. Also mentions how few goals off slapshots this year without Panarins one timer. Sharp unless he decides to retire unexpectedly either stays on active roster or goes on ir. I would think think ir would be preferable than bècoming a regular healthy scratch. I thought Sharpy could be like Bolly in 13 and Steeger in 15. Remember those guys didn’t have as good of a yr stats wise as they normally did/do. In the playoffs they made/helped on key plays. Might not be able to compare though because entire league is faster then 13 and even 15. Maybe Mo but to me he doesn’t look like everything is right healthwise. If he finds a way to contribute great. Which is why I say bump Schmaltz and Debrincat up. Schmaltz is a playmaker. Kane is a playmaker. Schmaltz has the same number of shots on goal in 6 more games as Franson. He’s 1 ahead of Wingels. Put him on the right with Toews and Saad, let him be a playmaker…puck will find the net. Debrincats shot with Kane on the other wing could be fun. He’s said he’s more comfortable and effective because he can one time it on the left. He’ll get more chances too. We’ve seen flashes of it when theyre on the ice together. I hate moving Schmaltz so much. But he’s obviously not a center. Q always wants a driver on each line. Might be an idea when a shakeup needed but doubt there is any big changes right now. I thought about 12 on left on 2nd line as clone of 72 there but thought of how they were neutralized in playoffs. Agree your 2 top playmakers on wings on same line but Schmaltz seems to work well with Kane too. Wouldn’t be a bad thing if a spot for 12 was found in top 6 and you had a 3rd line of Schmaltz, Hartman and Hino when he gets the call, all 3 can play center and alot of speed and skill. Part of the reason for Schmaltz with Kane was to create room because his strength is carrying puck through center ice which AA doesn’t and it allowed them focus on Kane in playoffs. I think Sharp is doing more than Hartman right now. They could key on that line in the playoffs because it was the only line doing anything. Ernie-D-Cat and Kane together make too much sense-they would be OK with a big center like AA. It’s more how they were shutdown than why Ernie that concerns me. Maybe at some point they get a chance, won’t be a bad thing just not sure its the best either. Remember when we wrote that the Hawks need another center? If Kero isn’t healthy enough to go regularly, Hartman isn’t going to cut it long term at 3C. So it’s either Hinostroza, Wingels or you figure something else out. As much as I’ve been anti-Bouma, the 4th line has been terrific lately. The 3rd is the hardest to figure out. I agree DeBrincat should be on a more offensive line but I’d prefer he swap w/ Panik on the Toews line w/ 19 & Saad. I like 12 for 14 swap with Hino at center and maybe Sikura the left winger after he signs in the long term. But Panik likely stays put at least until things start going south again. Based on tweets, it looks like Hinostroza and Kampf have been alternating at center. There’s an issue with Kero’s health?? If that was the case hed have been placed on IR and we would have had a call up. Some SOB flatlander hit him in head or high and head got hit. I forgot if there was no boarding call. 12 on the first line is inviting as well, except he’s on right wing. I think he also gets hit (sometimes hard) more on the right wing. Panik has had points in 2 of his last 13 games. In those 2 games he does have 5 assists. But he needs to get on the score sheet more consistently if he is to stay on the top line. Agree Panik needs consistency, some nights he has very visible and productive shifts and other games you hardly notice him out there. He needs to stay involved more game in game out to and be physical force out there. Lots of silly comments on here; you cant cut Sharp because of future FA seriously? What? Here is an interesting stat that most NHL fans know; 78.4 percent of teams in playoff position by the fourth Thursday in November have made it. It’s so notable that it is considered the NHL’s unofficial Thanksgiving rule. In one season’s worth of games to start his career (81) Hinostroza has a 39% faceoff win percentage. If you don’t like Schmaltz getting smoked in the dot all game long, you are not gonna like Hino doing the same thing only perhaps worse. That’s why Kampf has been taking some draws and centering his line sometimes in Rockford. He has great speed. He has used it effectively on the wing in the past and I suspect that is what he would be asked to do on the big club. Maybe he will get a stint at center too but if he does I would be shocked if he stuck there. He looked great on RW at the prospect camp I saw him in. Without an injury, something would have to give in the logjam of 8D the Hawks have, or they would need to decide to send a waiver exempt guy down like Hayden, but as one of the only guys with size and a physical game, they need more of what he brings, not less. Hino is the perfect example of how there are NHL guys playing in the AHL. It is just being in the right time and right place where there is an opportunity for you to show what you can do. The contract and waiver status of several of the guys on the bottom of the Hawks depth chart is the only thing keeping Hino in the AHL and he knows it. But I have a feeling that once he gets his chance this year, whenever that is, he will be more offensively consistent and he will stick. Amen Mike. Although your 81gp is off. Everyone wants Hinostroza over Kero and plug him at 3c. Hinostroza can skate. He’s put up points in the A. But he’s sucked at the dot when he’s been called up. His feet move faster than his hands. Too many times hed gain the line and fumble it. One player is better at the dot, fewer penalties in more games, and more points per game. I can understand why one player is on the hawks roster and the other isnt. The playoff thing by thanksgiving thing are stats from when theres only 9-12 good team in conference. Now theres 14 of 15 good teams in conference. Cannot go by that anymore. Well until theres 9-12 good teams in conference again. Wow …DCat with hat trick after two period …i remember when i said at the start of the season that Dcat should be playing for Rockford for the beginning of the season …i am glad he his with the big team now … we sent Shaw to Montreal to get Dcat ..what a move from Bowman ….a Pure sniper…so now i really think the Kid. Can reach 20-25 goals this year .